The CedarCreek Estate Winery in Kelowna slimmed its portfolio a few years ago and now offers just two ranges: the Estate range and, for its premium wines, the Platinum range. The latest releases show consistent quality in both ranges. These wines were made by Tom DiBello, the winemaker who left CedarCreek almost a year ago and now is a busy consultant about to release wines on his own label. One signature of his touch at CedarCreek was his use of premium French oak. No doubt, he cost the winery owners a modest fortune for barrels each vintage but the result was always worth it. These releases represent Tom at his best. CedarCreek fans can also relax. His successor as winemaker, Darryl Brooker, is Australian-trained and made excellent wines with several leading Ontario wineries before moving to the Okanagan in time to see Tom’s 2009 wines into bottle and to make the 2010 vintage. CedarCreek Platinum Chardonnay 2008 ($29.90). The winery has released 766 cases of this strikingly elegant wine. The wine was totally barrel-fermented but only spent 10 months or so aging in barrel and on the lees. As a result, the oak is so well integrated as to provide grace notes that frame the aromas and flavours. The taste and smell is very much fruit-first: aromas and flavours of tangerine with a richness on the palate and with a finish that lingers. The wine seems polished to a creamy roundness while retaining vibrant acidity at the core. 92. CedarCreek Platinum Pinot Noir 2007 ($39.90). The winery produced 677 cases of its top Pinot Noir. The wine incorporates four clones of Pinot Noir harvested from CedarCreek’s two Kelowna-area vineyards. The wine was aged 17 months in French oak before being bottled and then aged another 17 months before its release last September. The wine presents in the glass with the ruby hue of a gemstone, followed by toasty aromas of strawberry and cherry. On the palate, flavours of raspberry and cherry mingle subtly with oak. The texture is classically silky. On the finish, the wine is light but elegant. For those looking for power in Pinot Noir, this is not it. For those who admire delicacy and feminine charm in a Pinot Noir, this is definitely the wine. 90. CedarCreek Platinum Meritage 2007 ($39.90). Dark, full and concentrated, this wine begins with aromas of flowers, chocolate and black cherry which carry through on the palate, mingled with fig, cedar and tobacco, with a kiss of spice on the finish. There is a remarkable polish and elegance to this wine. It is a blend of 44% Merlot, 30% Cabernet Sauvignon, 18% Malbec, 5% Cabernet Franc and 3% Petit Verdot. The winery released 891 cases in November. 92. CedarCreek Estate Chardonnay 2008 ($17.90). The winery released 4,633 cases of this well-made wine at a fighting varietal price and under screwcap. The wine has classic aromas and flavours of citrus fruits, with a subtle hint of butter and oak. This appeals to those who want a Chardonnay where the fruit is out in front but with a little more complexity than is typical in the unwooded versions of this wine. 88. CedarCreek Estate Pinot Noir 2008 ($26.90). The winery has released 2,754 cases of this Pinot Noir. On the nose, there are aromas of toast from the barrels and black cherry from the fruit. On the palate, there are flavours of cherry and plum. The wine shows a generous structure. 88. CedarCreek Estate Syrah 2008($24.90). The wine begins with aromas of black cherries, and white pepper. On the palate, there are flavours of cherries and pomegranates with a hint of pepper on the finish. 88. Clos du Soleil, the small but premium Similkameen Valley winery that opened in 1998 with just two wines, is adding to its Bordeaux-styled portfolio with two more reds and with a Pinot Blanc from a grower’s vineyard. Spencer Massie, one of the winery principals, announced that this week during a winery dinner at Salt Tasting Room in Vancouver. That effectively answered a question some guests had when they came to the tasting: what kind of a winery dinner can you have with two wines? Well, if ever there is a venue for a minimalist tasting, Salt is it. As regulars know, this funky restaurant’s menu is limited to cheese, bread and cold cuts. But the staff is very adept at pairing the food to flatter the wine, not to overshadow the wine. And Clos du Soleil was able to show six wines. The winery poured both the two wines from its second vintage, 2007, and the two from its third vintage, the 2008 Capella (formerly White) and the 2008 Signature (formerly Red). I reviewed both in a January 21 blog, scoring both 90, and I stand by that. Even though Massie grew up in Kelowna, he and his partners are fans of Bordeaux wines and that determines, for the most part, the style of Clos du Soleil’s wines. The two whites are 95% Sauvignon Blanc, 5% Sémillon and are finished in a style that recalls the white wines of Graves. Signature, which sells for $38, is a blend of Merlot, Cabernet Sauvignon, Cabernet Franc and Malbec, all of them major Bordeaux varieties. Because the sun is more generous in the Okanagan and Similkameen valleys, these wines are a little riper than Bordeaux reds (a good thing in my view). The winemaker who has had full control of the cellar since the 2009 vintage (and influence over 2008) is Ann Sperling, a native of Kelowna who was in high school with Massie. Since becoming a winemaker in 1984, she has achieved national renown. In the 2009 vintage she decided to bracket Signature. A very limited production of a super-premium red is in barrel now. Guests at the winery dinner also tasted a barrel sample of 2009 Celestial, a red designed for earlier drinking and priced more approachably at $22.90. It is a delicious, juicy red with flavours of currents, plums, blackberry and blueberry. 88 points. The sixth wine of the evening was a 2010 Pinot Blanc, the first wine in what the winery calls its Grower’s Series. These will be wines made from grapes grown in other Similkameen vineyards whose owners share Clos do Soleil’s outlook on sustainable or organic production. The grapes for this wine were produced by Cawston grower Urs Baessler and his family. The wine has just been bottled. 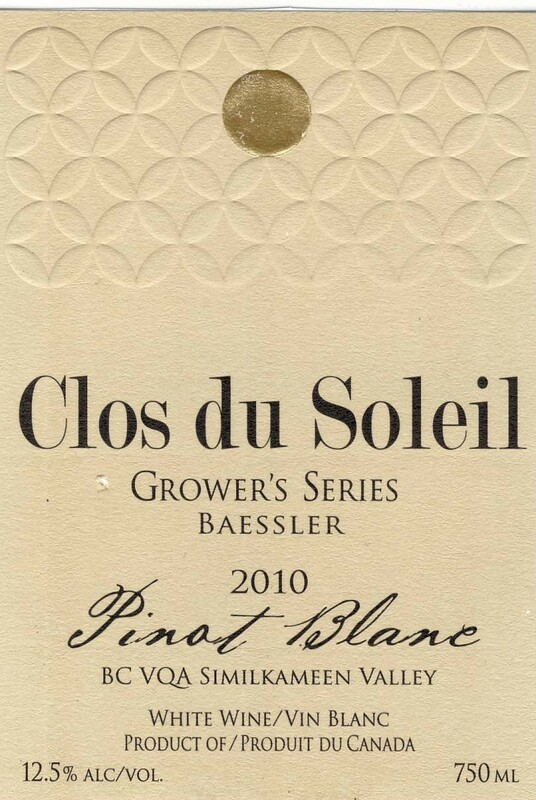 Clos du Soleil is releasing 280 cases through private wine stores after March 21. This is another 90 point wine. 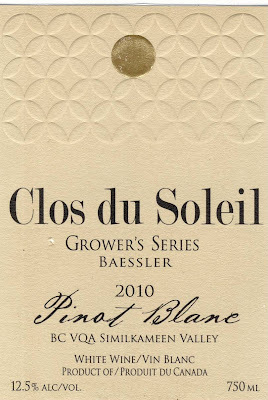 Clos du Soleil Pinot Blanc 2010 ($18.95) begins with aromas of lime and apples. On the palate, the tangy, fresh flavours recall sweet-tasting Ambrosia apples. The finish is reasonably dry yet with a honeyed ripeness. The wine has good weight and, with bright acidity, a refreshing character. The Forum for Women Entrepreneurs, a 400-member Vancouver organization that has celebrated women in business since 2002, chose to focus this year’s annual gala on women in British Columbia’s wine business. After reading their literature and attending the event, I had the sense that FWE’s organizers were somewhat overwhelmed by the number of women they found in the business. They published a list of 59. In the interest of full disclosure, I must tell you that I helped them identify individuals. My own list included additional names that did not make it onto the FEW list, which limited itself to the Okanagan and the Similkameen. There are another 70 or 8o wineries outside those valleys, most also with women as co-founders and active participants in the business. The point is that the wine business is not an old boys club. Women are hugely important throughout the British Columbia wine industry and that is certainly worth celebrating. It occurred to me that you could run tastings or host dinner parties for the next year with just those wines touched by women – and you would drink very well indeed. Let’s begin with producers in which women are the primary owners. Meadow Vista Honey Wines in East Kelowna and Middle Mountain Mead on Hornby Island are owned respectively by Judie Barta and Helen Grond. Both are model entrepreneurs. Judie has worked for other wineries in sales and also has had her own business – cleaning yachts. Helen was a consulting geologist before a lavender patch on Hornby mushroomed into a meadery. On the Saanich Peninsula, Carol Wallace, a former clerk of the Citizenship Court, owns and operates Dragonfly Hill Vineyards. In Kelowna, the public face of Sperling Vineyards in Ann Sperling, a nationally-renowned winemaker; and the public face of family-owned The View Winery is Jennifer Molgat, a former teacher. On the Naramata Bench, Prudence Maher was a founder with her husband of Red Rooster Winery in 1997. They sold it in 2005; and when the three-year non-compete clause expired, she opened Ruby Tuesday Winery. Further along the Bench, Judy Kingston will open Serendipity Winery this spring. She has made a big career change, having spent 25 years practising computer law. At Blasted Church south of Pentiction, accountant Evelyn Campbell is the co-founder and driving force. She made the gutsy decision to name the winery Blasted Church and to use edgy labels, a decision key to the winery’s market success. Silver Sage Winery south of Oliver is operated by Anna Manola, in the best tradition of wine’s most famous woman, Barbe-Nicol Ponsardin, better known as Veuve Clicquot. She became a widow in 1805 after seven years of marriage. By the time she died in 1866, this had become one of the great houses in Champagne. Anna became a widow in 2002 and has carried on with courage and determination. At Tinhorn Creek Estate Winery, winemaker and co-founder Sandra Oldfield came from California in 1994 to become one of south Okanagan’s most influential winemakers. She has mentored quite a few budding winemakers in her cellar. There are female winemakers throughout the industry. Andrew Peller Ltd. has Stephanie Leinemann at Peller Estates (she has won two Lieutenant Governor’s Awards of excellence), Karen Gillis at Red Rooster and Sandy Leier at Calona Wines. At Jackson-Triggs Vintners, the red wine is made by Brooke Blair. At Hillside Estate Winery, Kathy Malone is the second woman winemaker in succession. She came from Mission Hill where Trish Cooper took her place. At Le Vieux Pin, French-trained Severine Pinte makes the wines. In West Kelowna, Alana Lubchynski makes the wines at family-owned Beaumont Estate Winery. At Garry Oaks on Salt Spring Island, Elaine Kozak, an economist and a co-founder, makes the well-regarded wines. At Beaufort Vineyards near Courtenay, Susan Vandermolen, who founded the winery with her husband, is the winemaker. And consultant Christine Leroux, a Canadian trained in France, consults to at least half a dozen wineries, including Rustic Roots where her mentorship has turned Sara Harker, a member of the family that owns the winery, into a leading maker of fruit wines. To that list, you can add the many women who have been fundamentally important both to the wineries they are involved in and to the industry. They run the business, fill out the endless reams of reports government demands, run tasting rooms, making marketing decisions – and work in vineyards. In the interest of brevity, I nominate Gray Monk’s Trudy Heiss as the poster person for this entire group. Since she and husband George planted a vineyard in 1972, she has done almost everything from driving the tractor to marketing to dealing with government bureaucrats, making a considerable contribution to the success of both the winery and the industry. There is a legendary story about Trudy. Sometime early in the 1980s, she was included in a delegation of wine people that went to Victoria for a crucial meeting with government bureaucrats. Somebody who was not thinking arranged for the meeting to be in the Union Club which, in those days, did not admit women. Fortunately, Trudy is short and also courageous. The men in the delegation surrounded her, screening her from Union Club staff as the party shuffled up the stairs to the meeting room. The topic of the meeting is now forgotten but I would venture that the quality of the decisions was that much better with Trudy’s participation. New owners have come forward for several of the properties of the bankrupt Holman Lang Wineries Ltd. group. Two of the transactions involve new players in the B.C. wine industry. This Friday, an application goes before the B.C. Supreme Court for the sale of Lang Vineyards Ltd. to an individual named Yong Wang. Through the firm of Sotheby’s International Realty Canada (which had listed many of the Holman Lang assets in 2009), Wang is offering $2,199,000 for the winery. He had made an earlier offer of $1.5 million which was rejected by Wolrige Mahon Ltd., the receiver. Documents filed in court show that the receiver has been playing hardball to get the best possible offers for Lang Vineyards, which Holman Lang had purchased in 2005 either for $2.6 million or $3.5 million. Both figures appear in filings by the receiver. The receiver rejected earlier bids for Lang as well – a lowball offer of $525,000 and a subsequent $945,000 bid for the land and buildings. Unless a higher bid is placed before the judge on Friday, Yong Wang will be able to take over Lang. This winery arguably is the most desirable of the seven wineries that have been in receivership since last November. The winery was one of two farmgate wineries that opened in 1990 on the Naramata Bench. Günter Lang, who established Lang Vineyards, sold the winery to Keith Holman, who topped an offer that an American purchaser had floated. At the time, Holman owned three other wineries, none of which had acquired much of a following for their wines. He needed Lang because it had a good reputation, an established distribution network for its wines and, in winemaker Bernard Schirrmeister, a trained and experienced winemaker. Günter Lang also agreed to stay on as a manager in the Holman Lang group, an arrangement that eventually broke down. Schirrmeister also left the group a year ago. Wang, who takes over a modest wine inventory, faces a rebuilding job, although consumers still remember the Lang Farm Reserve Riesling as one of the Okanagan’s top Riesling wines. Earlier this month, the court also approved the sale of the Stonehill Estate Winery for $1.5 million, a last minute bid that topped a $1.3 million offer from Banbury Holdings Ltd. of North Vancouver. This winery was listed in 2009 by Sotheby’s at $3.9 million. The new owners of Stonehill are Wayne and Margareta Nystrom in partnership with Gavin Miller, the former winemaker at Painted Rock Estate Winery, and his wife, Shana. Nystrom, who has lived in Penticton since 2005, is a former partner in NLK, a pulp and paper consulting company, and a former chief executive of Pacifica Papers Inc.
Stonehill opened in 2001 as Benchland Vineyards, changing its name after Keith Holman took it over in 2004 at the same time as he was developing Mistral Vineyards next door. No purchase offers have yet been announced for Mistral, along with Soaring Eagle, Zero Balance and K Mountain, the other wineries in receivership. Two pieces of Holman Lang orchard property have been sold. One of them on Sworder Road, near the La Frenz winery, is being purchased by Michael Dinn and Heidi Noble of JoieFarm, primarily for the development of a private residence. When you pay the price for a premium red wine that is still young, you seldom get your money’s worth unless the wine is decanted or unless it is cellared for several more years. Decanting works well for the impatient. Two icon reds and a decanter from Denmark came across my desk recently. The experience was instructive. Seven Stones The Legend 2008 ($45) arrived before the decanter and was tasted without its benefit. This is a bold Bordeaux blend – 50% Cabernet Sauvignon, 30% Merlot, 12% Petit Verdot, 8% Cabernet Franc. The wine begins with complex aromas of leather, earth, currants and figs. On the palate, there are flavours of plum and chocolate. The structure is ripe and muscular. 92. Seven Stones Winery in the Similkameen released only 50 cases of this, its first “icon” red. Most of it is now sold out and collectors will be awaiting its successor, when or if winemaker George Hanson releases another. I will certainly decant the next one. Painted Cabernet Sauvignon 2008 ($40) is the wine that did get the full Danish treatment. The aroma is dramatic – dark fruits (currants, figs, prunes), tobacco and vanilla. The texture is immensely concentrated and tight. I poured a glass before decanting the wine and then compared the two. The decanted wine was more evolved, with emerging flavours of fig, mint, vanilla and cedar. The undecanted wine still was closed. Even if you decant, I recommend cellaring this wine a few more years. 93. This is the second vintage of Cabernet Sauvignon from Painted Rock. The 2007 won a Lieutenant Governor's Award of Excellence last year. The 2008 will be served at the Vancouver Playhouse International Wine Festival's Bacchanalia Gala next month - presumably decanted. The Menu Wine Breather decanter is from a Danish company called Menu A/S. It was sent to me from Creative Danes Inc. in California. The decanter and breather, which retail for $69.95, are currently available in two Vancouver stores: Homewerx - The Modern Lifestyle Store at 1053 Davie Street (604-682-2204); and Atkinson's of Vancoiver at 1501 West Sixth Avenue (604-736-3378). What sets this decanter apart from others is the silicone stopper that fits into the neck, designed to accept a bottle of wine. The way to use it is to open the wine, shove the decanter and its stopper down over the mouth of the bottle and then invert them. The stopper causes the wine to swirl around the neck and down the sides of the decanter. That exposure to air opens the aromas and flavours of a young wine. Indeed, the booklet that comes with the decanter boasts of “ready-to-drink wine in less than 2 minutes.” I did not think the wine opened quite that quickly but it certainly opened. Using it is, to quote the booklet, “a spectacular little show.” Will I have the nerve to try this at my next dinner party? There are numerous other gadgets as well for aerating wines. Any shop that sells good stemware will have some gadget or other. All have a selection of decanters which also will help a wine open up but just not in two minutes. It all depends how impatient you are. The newest label from the Okanagan is StompinGround Winery, which has just released three wines to the VQA and other wine store channels. It may not be new as you would think: the wines are all from the 2006 vintage. Of course, there is a story here. The label belongs to a Vernon winery that is licensed as The Cellars at the Rise and is based on a vineyard that was planted in 2005 and 2006. The winery initially was part of The Rise, an ambitious real estate, resort and golf course development launched by Okanagan Hills Development Corporation. In late 2008, courtesy of the global credit crunch, the project came under the protection of the Companies’ Creditors Arrangement Act (CCAA). After a restructuring of its debts, the project emerged from CCAA late last year and the stalled winery is going ahead again. During the years when The Rise was under CCAA, the grapes that the 17 ½ acre vineyard began producing - including Pinot Noir, Riesling and Gewürztraminer – were sold to other Okanagan wineries, including JoieFarm and Intrigue Wines. The wines released to the market were made and finished by consulting winemakers. They were made at a time when the grand plans called for underground cellars, a Tuscan-style winery, with a capacity of 35,000 cases. The plans now are much more modest. Even the tasting room is on hold, at least until the response to the brand is assessed. The site, just a few kilometres west of Vernon along Bella Vista Road, cries out for a grand winery. The vineyard is on a sun-bathed slope high above the north end of Okanagan Lake, with spectacular views, even by the Okanagan’s extravagant standards. The vineyard’s aspect takes advantage of a special microclimate for growing grapes. The varieties planted here were chosen intelligently for the site, which has the potential to produce excellent Pinot Noir and Riesling. Indeed, the Riesling that Roger Wong makes at Intrigue from these grapes would rank among the top 10 Okanagan Rieslings. This slope has a chequered history of winemaking. One vineyard here grew grapes successfully from about 1965. This vineyard became the base on which the Bella Vista Vineyards winery was opened in 1994 by a group of Vernon investors and hobbyists led by Larry Passmore, formerly the owner of a U-Brew store in Vernon. Bella Vista struggled; its partners fell out among themselves, the vineyard was neglected and the winery closed in 2005. But it may rise again as Turtle Mountain Vineyards. Market gardener Sid Sidhu, whose family has operated nearby Bella Vista Farm Market since 1987, bought the vineyard. He has rehabilitated it and is reportedly planning to open a winery either this year or in 2012. Sidhu is already the landlord for Planet Bee Honey Farm, which operates next door to the farm market. Ed Nowek, the owner of Planet Bee, now has a license for the first meadery in the north Okanagan. He was planning to start selling mead late last year but delayed that because, in his judgment, the mead was not yet ready. Turtle Mountain, Planet Bee and now The Cellars at the Rise should transform Bella Vista Road into a destination attractive to wine tourists. Here are notes on the first wines. StompinGround Crush Pad White 2006 ($12.95). This is a blend of 43% Pinot Gris, 46% Muscat and 11% Gewürztraminer. Sitting around for about four years did not do this wine any favours. It still has spicy aroma one expects from these varieties, along with guava and peach flavours but the acidity is soft. The wine is best well-chilled which brings back echoes of its youthful exuberance. 86. StompinGround Pinot Noir Reserve 2006 ($19.95). This is also getting tired. It still has the cherry aromas and flavours of the variety, however. 84. StompinGround Merlot Reserve 2006 ($19.95). Here is a variety that benefits from cellaring. The time in oak has given this wine vanilla aromas. It is full-bodied with flavours of currants and a touch of spice on the finish. Think of this wine with your next barbecue. 88. These wines were made with purchased grapes. I look forward to what the winery can do with its own grapes, with a new winemaker (negotiations are under way) and with a wine release schedule not entangled with CCAA. Judging from what the winery is charging for its wines, it seems that consumers have not quite caught on to the significant quality improvements in recent years by Andrew Peller Ltd. in British Columbia. Eight or nine years ago, the wines were pretty ordinary. But in the last two years, Peller wines have won back to back excellence awards at the Lieutenant Governor’s wine competition. A few years ago, a competitor told me that this was the “most improved” winery in recent years. The reasons for this change are fairly simple. 1. Peller took over Calona and Sandhill wineries in 2005. The package included Howard Soon, Sandhill’s winemaker. He became the senior winemaker in British Columbia for the Peller group. He introduced the discipline of winemakers spending a lot more time supervising vineyards than Peller had previously done in British Columbia. That discipline is fundamental to getting good grapes and making the decisions that produce good wine. 2. Stephanie Leinemann, a top flight winemaker who had started at Calona Wines in 2003, took over the Peller winemaking in 2005. A Kelowna native, she became enthused about wine when she took a break from college to work in a restaurant in Germany’s wine country. Returning to Canada, she switched to Brock University’s new wine school. She graduated with an honours degree in 2003, scoring so highly that she won the President’s Medal as the top graduate that year. 3. Peller has taken more control of its grape sources, growing more and more of its own grapes and relying less on growers. Given that background, consumers are learning to anticipate new, affordably-priced releases from Peller. Here are notes on four current releases, two from the entry-level “Family Series” tier and two from the more ambitious “Private Reserve” tier. Hester Creek Estate Winery is rolling out its wines this spring, including a red icon wine called The Judge, under sophisticated new labels, drawing attention to the magnificent turnaround here over the past several years. The potential of one of the best, and oldest, vineyards on the Golden Mile is finally being realized in the wines that winemaker Rob Summers has been making here since arriving from Ontario in June, 2008. The new labels, clean and uncluttered, will be on wines that Hester Creek is introducing at the Vancouver Playhouse International Wine Festival at the end of March. The $15.99 wines, in fact, are in the market now under the old labels. The winery held back a portion of those to be released with the new labels. It should give consumers a rare opportunity of watching a winery brand as it is in transition. The old labels have the winery’s name in surprisingly small type, almost as if the owners were a bit embarrassed. The new labels feature the winery’s name boldly, telegraphing the new pride and confidence among the people behind this brand. Some of the labels also include a button with the date, 1968, on it. Hester Creek wants consumers to know that it has what is almost certainly the oldest vinifera in the Okanagan. The vineyard was planted by an Italian immigrant, Joe Busnardo. In the 1960s, everyone else was planting French hybrids in the belief that the Okanagan was too cold for vinifera. Joe wanted a premium for his grapes, rightly so, but no winery was willing to pay it. So for several years, he let the birds eat the fruit. Finally, he had to open his own winery, Divino, in 1983. He relocated Divino to the Cowichan Valley in 1996 after selling the Okanagan winery. The new owners, including the legendary winemaker, Frank Supernak, renamed it Hester Creek after a creek flowing down from a nearby mountain. It was apparently named for a young woman who may or may not have swum in it: both the old and the new labels incorporate a female swimming behind a fish. Supernak left in 2002, fed up with the increasing chaotic way Hester Creek was being managed. Tragically, he died in an accident at another winery that fall, spared from the spectacle of Hester Creek sliding into receivership. The winery’s fortunes turned around when Curt Garland, a Prince George trucking executive, bought the rundown winery in 2004 in a court-ordered auction. The transformation of Hester Creek since Garland took over has been nothing short of astonishing. In 2008, he recruited Rob Summers, a winemaker whose 23 years of experience included being the national winemaker at Andrew Peller Ltd. Rob already knew that the Hester Creek vineyard could produce great grapes. He had been buying some for the Peller winery in British Columbia. He even considered bidding on Hester Creek himself until concluding it was beyond his means. Curt Garland paid over $5 million, which included paying off all of the winery’s creditors. He has probably spent as much on it again. Blueprints had already been drawn for a new winery when Rob arrived. “Can we make some changes?” Rob asked. Garland asked what he had in mind. “Can we start over?” And his employer agreed. Rob had the rare experience of designing a winery from scratch and buying state of the art equipment for it. The winery that opened in the fall of 2009 is one of the reasons for the noticeable rise in the quality of Hester Creek’s wines. The ramshackle original winery, now gone, had all sorts of issues that mitigated against good wines, including a resident population of brettanomyces, a spoilage yeast that, if it gets out of hand, yields pretty rustic wines. Rob had it under control in the old winery. He does not have it in new winery, which is designed with sanitation in mind. Thanks to the deep pockets of the winery’s owner, Rob has been able to buy eight Italian fermenting tanks – no other Okanagan winery has yet ordered them – that are much more effective at extracting color and flavour from red grapes without harsh tannins. The winery’s juicy, approachable 2009 Cabernet Merlot, an absolute steal at $15.99 a bottle, illustrates why the new fermenters are worth having. Last year Garland also recruited a general manager. Mark Sheridan, an Australian-trained viticulturist, came to the Okanagan in 1999 and managed the Vincor vineyards for about 10 years. His background enables Hester Creek, which already has an experienced vineyard manager, to take the viticulture on its 70 acres of mostly mature vines to the next level. The vineyard has already been converted to drip irrigation, both for better water use and for more efficient vine management. With the new winery and the six luxury villas on the hill above the winery, Hester Creek has become a destination. It has an elegant wine shop and a demonstration kitchen where visiting chefs run cooking schools all summer long. This spring, Hester Creek’s former tasting room will reopen as a restaurant. Several new wines are also going to be released in late March. Under the Characters label, there is a white blend and a red blend, both selling for $19.95. The $45 icon red is The Judge 2007 (220 cases), a blend of Merlot, Cabernet Franc and Cabernet Sauvignon with about two years of barrel age and more than a year of bottle aging before release. It still has five to ten years of aging ahead of it. It is a big wine with firm tannins, with mint, vanilla and black currants on the nose and with a complex flavour profile – currants, black pepper, figs, with a hint of liquorice on the finish. 92. Here are the other new releases, all made totally by Rob. Hester Creek Pinot Blanc 2009 ($15.99). The vineyard includes 18 acres of Pinot Blanc, a good deal of which was planted in the 1970s. That makes for intense flavours and a mineral backbone in the wine. It begins with aromas of sage and apples, has flavours of apples and melon and has bright acidity. This is a finely focussed and very refreshing white. The winery released 2,400 cases. 90. Hester Creek Sémillon Chardonnay 2009 ($15.99). There are 1,200 cases of this wine which is roughly a 50/50 blend of the two varieties. The Sémillon brings a refreshing note of citrus and pineapple to complement the apple and melon of the Chardonnay. The wine is done all in stainless steel to preserve its bright and appealing fruit. 90. Hester Creek Cabernet Merlot 2009 ($15.99). The winery has released 4,500 cases of this wine, a blend built around Cabernet Sauvignon with Merlot and Cabernet Franc. It is a very quaffable wine, with aromas of plums, cherries and vanilla and with lovely fruit flavours, including lingonberry and black currant. There is spice on the finish. 89. Hester Creek Reserve Merlot 2008 ($25.99). The winery is releasing 1,100 cases of this wine. It is a pretty, perhaps feminine, interpretation of this variety, soft and full in texture with a hint of blueberry on the palate and with a lingering finish of spice and red fruit. 91. Hester Creek Reserve Cabernet Franc 2008 ($25.99). The winery is releasing 950 cases of what it calls, rightly so, “a rustic wine for hearty food.” In this context, rustic is a positive descriptor that often comes to mind with this variety because of its brambleberry flavours. The wine has notes of cherry and raspberry and pepper with enough ripe tannin to provide the grip needed for the foods it cries out for. Think venison. 91. Thirty-one Canadian wineries plan to host a tasting of 54 Chardonnays in New York on March 8, following up on a Chardonnay tasting done last spring in London by 22 Ontario wineries. There is no doubt that Canadian producers these days have enough quality wine to explore export markets. 1. Why are there only six British Columbia Chardonnays at the New York event? These two tastings are clearly an initiative of the Wine Council of Ontario. Was British Columbia an afterthought or was the ball dropped by the British Columbia Wine Institute? Or is it that British Columbia wineries realize they will get more bang for the buck by hosting tastings in Toronto and Calgary. The consumers there, unlike American consumers, at least know there is a wine industry in British Columbia. Six Chardonnays, even if they are among our best, won’t make much of an impression in New York. 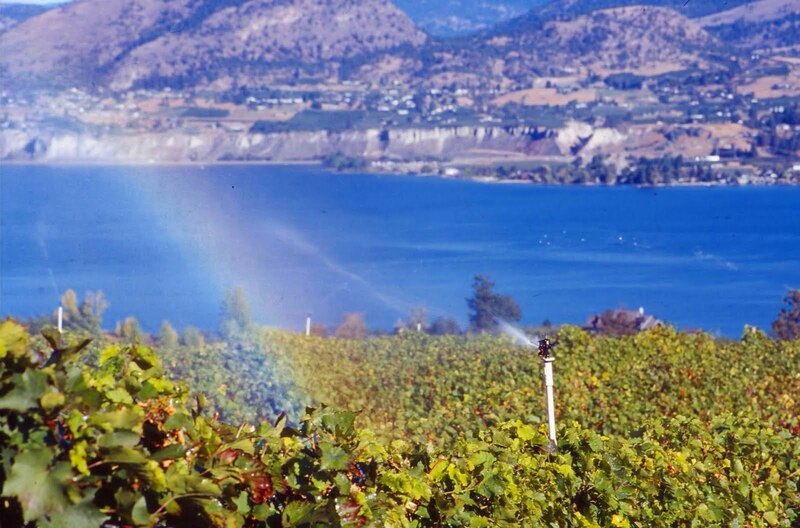 Perhaps few Okanagan wineries bothered to participate – or even knew this was going on. I would guess that most British Columbia wineries prefer to promote themselves exclusively as British Columbia wine rather submerge themselves in a sea of Ontario wines, however good those wines have also become. The British Columbia wines in New York are limited to two from Burrowing Owl, two from Quails’ Gate and one each from Meyer Family Vineyards and Mission Hill Family Estate Winery. These are excellent choices but hardly the only top flight Chardonnays in British Columbia. 2. Why Chardonnay? The variety has been out of fashion for some time. There may be little rhyme or reason why consumers have turned away from Chardonnay, but that is an unfortunate fact. In British Columbia, Pinot Gris rivals Chardonnay in quality. And it has been a hot varietal for about eight years in the North America market. We also produce excellent Viognier, to name another variety that is hotter than Chardonnay. 3. Are we just fishing for some complimentary pats on the head from Jancis Robinson or The Wine Spectator? Do we still need validation that our wines are world class from people who live somewhere else? In Britain, there might still be the lingering stigma from the disastrous wine tastings which Canadian wineries – mostly the Ontario wineries – hosted periodically in London in the 1970s and 1980s. The English wine writers just sniffed at the mediocrity that was poured. In 1984 Hugh Johnson, the dean of British wine writers, brushed me off totally when I asked him to look at the manuscript of my first book on Canadian wine. In retrospect, I quite understand; our wine industry was just emerging from the Dark Ages. British snobbishness toward our wines is a thing of the past. By all reports, the British wine press – one of the hardest audiences to please – was impressed last spring. Whether that translates into sales is quite another thing. The wines for the tasting have been screened by a tasting panel of wine judges, all from Ontario. That, along with the quality of Ontario Chardonnay, may account for the overwhelming number of Ontario wines in the coming New York tasting. When the Wine Council of Ontario gets foreign junkets out of its system, perhaps it should consider bringing a tasting like this to the west coast. It would make for a spectacular tasting at Cornucopia in Whistler. I would venture that the British Columbia market would be at least as receptive to Ontario Chardonnay as New York or London.